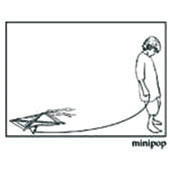 Minipop, the San Fran-based quartet that is fast gathering its fair share of Web-based street cred, takes the notion of dream pop to new heights on its as yet unreleased debut, A New Hope. Brimming with lush guitars, angelic vocals, and aggressive drum and cymbal pounding, A New Hope immediately calls to mind the instrumentation and lyrical stylings of Eisley and, to a less angsty degree, Tegan and Sara. And while the breathiness and echoing sounds of songs like “Precious” and “My Little Bee” get a bit repetitive, the immaculate arrangements of “Someone to Love” and meandering lyricism of “Fingerprints” more than make up for album’s lack of range.